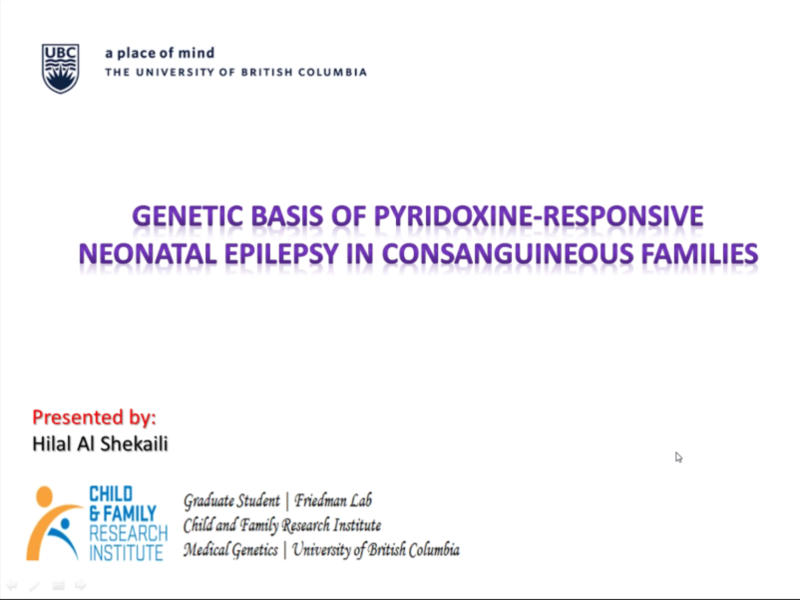 Hilal Al-Shekaili is a PhD student at the University of British Columbia who conducts research in rare, autosomal recessive disorders, specifically pyridoxine-responsive epileptic encephalopathies (PREE). PREE is often characterized by recurrent seizures in the prenatal, neonatal, or postnatal period, which are typically resistant to conventional anticonvulsant treatment but are well-controlled by the administration of pyridoxine (vitamin B6). Hilal and his colleagues at UBC are undertaking a research project to identify novel genetic causes in unexplained forms of pyridoxine-dependent epilepsy (PDE), a special type of PREE with an estimated incidence of 1:20,000 to 1:750,000. In most affected infants, PDE is caused by mutations in the antiquitin gene (ALDH7A1) and subsequent inactivation of α-aminoadipic semialdehyde dehydrogenase (antiquitin, ATQ). Currently, ALDH7A1 is the only gene for which mutations are known to underlie PDE. However, locus heterogeneity has been reported in some families and other genes seem to be involved. Nearly 5% of children with a typical clinical picture of PDE harbor no detectable mutation of ALDH7A1. Identifying causative genes in such families will likely lead to improved treatment for these patients and help unravel much of the unknown about pyridoxine metabolism in the human body. In this webinar, Hilal will cover how he and his team used whole-genome SNP genotyping, genome-wide runs of homozygosity (RoH) mapping using SVS, and whole-exome sequencing to characterize the genetic defect underlying PREE in a consanguineous Omani Arab family with two affected children who have a PDE-like clinical picture but negative ATQ biomarkers. Hilal Al-Shekaili is aPhD student studying Medical Genetics at the University of British Columbia. Before coming to UBC, Al Shekaili earned his BSc degree in Biotechnology and his MSc in Biology from Sultan Qaboos University in Oman. Currently working in the Friedman Lab, Al Shekaili's research is focused on rare, autosomal recessive disorders, specifically pyridoxine-responsive epileptic encephalopathies(PREE).